Our new kitchen gallery is here! After many months of development, we are delighted to bring you our new kitchen gallery. It’s really pretty cool, if we do say so ourselves! What’s so great about it is the flexibility you have to search based on a range of keywords, colours and design elements. 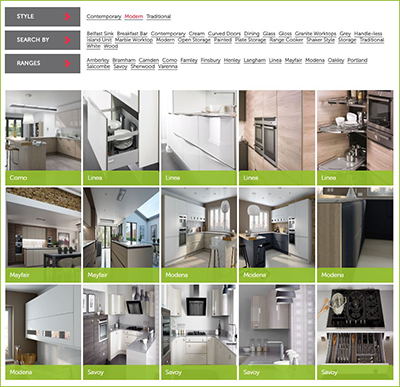 Where before we had separate galleries for style and colour, now all kitchen images are in one area and you can sort and define them by a range of criteria. For example, in Style you can select Modern, Contemporary or Traditional but you can also search for kitchens that are Painted, in Grey with a Range Cooker and have an Island Unit using the Search By section – you can really leave it as wide or as specific as you like. To search on one keyword alone just click the refresh button between searches or continue selecting to build up a string of criteria. All thumbnails are labelled with the name of the range that it belongs to. See a range popping up that you like? Just click on the name in Ranges and it will show all photos in that range along with a description. To take a closer look at any image, just click on it to zoom to full size. You can then browse through all the gallery images at full size by by clicking the forward and back arrows. We think that it offers much more flexibility and is a much more effective way for you to build up ideas for your new kitchen – why not use them to create a Pinterest board and share your ideas with us? We’d love to know what you think of the new gallery. Please share your comments with us on our Facebook page or send us a message. Of course, we can’t show you everything that we can offer here so if you’re ready to move on to the design stage please arrange a design consultation which is totally free of charge. Just call us on 0800 321 3491 or complete our request form. 0 Responses to "Our new kitchen gallery is here!"